Donations and volunteers are always welcome! ​Give in whatever way suits you best. Charitable receipts available upon request for donations of $10.00 or more. Fresh garden produce can be dropped off at the Food Bank during regular hours (Tue. & Fri. 10:00am-12:00 Noon), OR, call (780) 662-3511 to make arrangements. 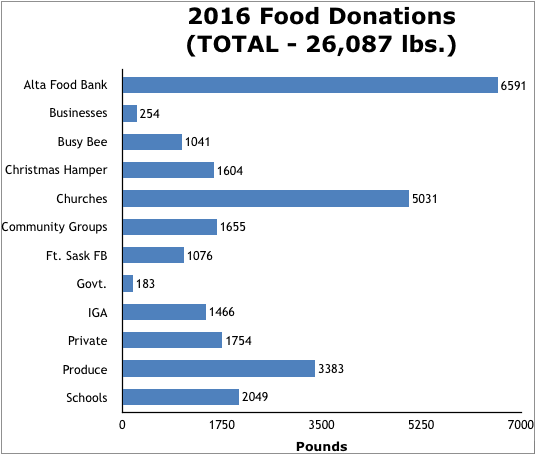 ​These are the figures for pounds of food donated in 2016. A huge thank you goes out to our supportive community! *The Food Bank cannot accept home baking or preserves or non-government inspected meat. **Tofield Ryley & Area Food Bank is a member of Food Banks Canada and Food Banks Alberta. On occasion we are able to access food from this wider network. ***A Health Inspector visits our Food Bank to ensure good hygiene and proper food handling protocols are being followed. We love our volunteers and none of this would be possible without all their help. There are all kinds of tasks available, choose one and join the team! Our regular Hamper Distributor volunteers may sign up for as many shifts per month as they wish, shifts are Tues. 10am-12noon and Fri. 10am-12noon. We also need occasional volunteers to help tackle the list of random tasks pop up, whether that's picking up food, cleaning, building garden boxes, picking potatoes, unloading and shelving food drives, or preparing recipe kits. For more information, contact our volunteer coordinator, Brenda Friedenberg, at trafbs@gmail.com or (780) 662-3609. Support the Tofield Ryley & Area Food Bank by registering for a free membership. Members help us retain our status as a charitable organization. Membership is open to the public and all members over the age of 18 are welcome to vote at the AGM. To register, please contact our secretary, Lynne Melanson, at trafbs@gmail.com or (780) 662-3511.